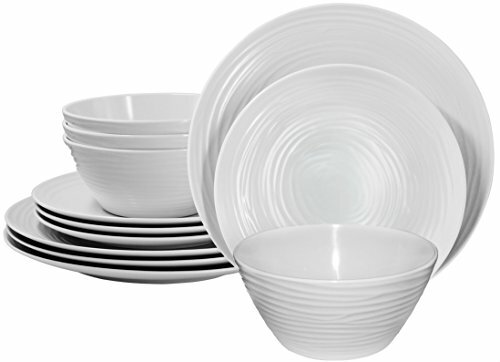 Parhoma proudly introduces 12pc Melamine dinnerware set for 4 people. This dinner set includes 4 dinner plates, 4 bread and butter plates and 4 soup and salad bowls. 100% Melamine material provides durability to resist chip, crack, and break. Products are produced by ISO certified manufacturer supplying major US chain stores. Parhoma melamine products are tested through rigid FDA's regulations for BPA free. Dishwasher Safe, Stain Resistance, Heat Resistance up to 212° Fahrenheit. Not microwaveable. Simple basic white with texture contemporary style design perfectly for everyday indoor use or outdoor event. Standard size -dinner plate 10.50"(D) x 1.125"(H), bread plate 8.50"(D) x 0.875"(H), 30 oz Bowl 6.25"(D) x 3"(H). If you have any questions about this product by Parhoma, contact us by completing and submitting the form below. If you are looking for a specif part number, please include it with your message.